producing beautiful hot, clean flames. 1. 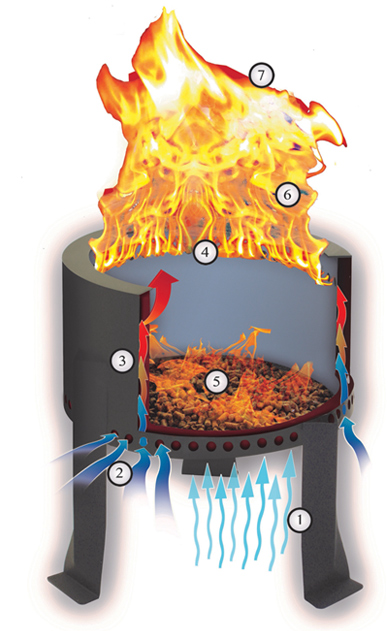 Air rises through grate holes into gravitational heating chamber, and also provides combustion air for the wood pellets. 2. Air enters the gravitational heating chamber through lower outer cylinder holes. 3. Air inside the gravitational heating chamber is heated, expands and rises. 4. A stream of heated air exits from each upper hole on inner cylinder. 5. Wood pellets burn, producing flames, heat, and combustible gases. 6. A special entertaining bright smokeless ring of flames is produced when the rising combusible gases meet the hot fresh air exiting the upper interior ring of holes. 7. The hot combustible gases not burned lower down continue to rise and burn with bright smokeless flames.